American Spirit is Now on Facebook! We are excited to announce that American Spirit magazine has joined DAR Headquarters, the DAR Museum and the DAR Library on Facebook! With our new Facebook page, readers now have the opportunity to interact with other readers, receive updates on the latest issue, behind-the-scenes teasers and more. 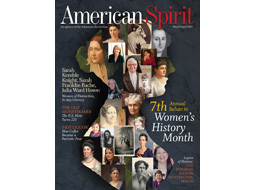 “Like” our page and follow along at www.facebook.com/AmericanSpiritMagazine. Have you been a long-time supporter of our publications? Visit our Facebook page and tell us why! Maybe your favorite aspect of American Spirit is the well-researched articles that focus on notable figures from American history. The March/April 2017 issue is our salute to Women’s History Month and features Sarah Kemble Knight, noted diarist and adventurous traveler; Julia Ward Howe, abolitionist and author of “Battle Hymn of the Republic”; and also Sarah Franklin Bache, daughter of Benjamin Franklin and Revolutionary cause supporter in her own right. Are you more interested in our coverage of historic events or stories that explore the uniquely American experience? This issue also examines the history of coffee in the United States. No one is certain when coffee was first introduced on our shores, but experts agree colonists began drinking it during the 1670s. It would later become a common replacement for heavily taxed tea. Perhaps you’re curious about preservation and enjoy the stately historic homes featured in every issue. We tell the story of the General Jedidiah and Faith Trumbull Huntington House, built in Norwich, Conn., in 1765. Today, the privately owned home is included every October on the Norwich Historical Society’s walking tours. Do you first flip to the Spirited Adventures department when you receive your new magazine? Our writers travel the country, giving historical context to the cities we visit. The destination in this issue is Nacogdoches, Texas, also known as the Garden Capital of Texas. The city boasts several other gardens, antique shops and farmers markets that make a trip to Nacogdoches memorable. What do you enjoy most about American Spirit magazine? Maybe it’s all of the above. Whatever it is, we want to hear about it. Come interact with fellow readers and subscribers on our Facebook page! While you’re there, we invite you to take some time to explore. Leave a review, browse through photos and engage in conversations on our posts. In conjunction with posts and photos, we’ve also added special tabs on the left side of the screen that highlight different subscription packages and making it easy to subscribe. Click on the Services tab to find information on subscription rates, both domestic and foreign. For a quick breakdown of these rates, visit https://www.facebook.com/AmericanSpiritMagazine/services/. After you’ve decided what type of subscription you would like, either call the toll-free number listed on the Services tab or click on the Shop tab. You can go directly to the Shop tab by visiting https://www.facebook.com/AmericanSpiritMagazine/shop/. The Shop will take you to our secure site where you can purchase a subscription online. Be sure your subscription is up to date—you don’t want to miss out on all the fun!